The fencing club, which has been running for two years, is flourishing. 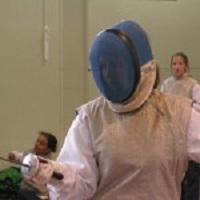 A number of pupils have already made the step from novice to intermediate fencer. The club is aspiring to take part in the public schools fencing championship next year, and a number of our girls were in the audience at the event in Crystal Palace this year, sizing up the competition. Girls have been honing their skills in a number of friendly fencing competitions with local schools as well as our own inter ladder-style competition. Students start by learning the basic stance and footwork and tactical ploys to strike their opponent as well as the fundamentals of refereeing and scoring a fencing competition.